Tour Description Say Hello to China when your tour starts! There are many famous cities and exciting attractions in this route. You will see Nanjing Road, Yuyuan Garden, Shanghai Museum in Shanghai, seeing Guilin and Yangshuo’s beautiful and natural landscape in Guilin and Yangshuo, enjoying the Terracotta Warriors and Horses Museum and Big Wild Goose Pagoda in Xi'an, Viewing the Forbidden City, Temple of Heaven, Mutianyu Great Wall and Summer Palace in Beijing. You will see Chinese tour culture and civilization! Say hello to China！ Our guide will meet you outside the baggage claim area at shanghai Airport and transfer you to the hotel. The rest of the day is on your own to explore the city. If you want to add tour itinerary today, please let us know your flight land time and we can arrangement it for you. Tourist spot：Shanghai Museum - Jade Buddha Temple - Nanjing Road - the Bund - acrobatic show After breakfast at hotel, you will visit the Shanghai Museum, which houses 110,000 historical objects and 430,000 reference pieces, followed by a walk on People's Square. Jade Buddha Temple, named for its two jade statues of Sakyamuni. One was carved out of a single piece of white jade weighing one ton. After lunch proceed with a promenade of famous Nanjing Road, the busiest commercial center in Shanghai. Then, you will visit the Bund, a five-block riverfront lined with many of Shanghai's banks and trading houses. After dinner, you will enjoy an acrobatic show with breathtaking motorcycle performance or Huangpu River Night Cruise Trip. Tourist spot：Yu Yuan Garden - Shanghai World Financial Center - Tianzifang alley After breakfast, head to Yu Yuan Garden and Old Bazaar. This classical Qing Dynasty garden has over 30 pavilions linked by a maze of corridors and bridges over ponds. You will be arranged to have lunch in Yu Yuan Garden area. In afternoon, you will first visit the Shanghai World Financial Center, which is located in the center of the Lujiazui Finance and Trade Zone. With 101 floors above ground level and soaring to a height of 492 meters, this project embodies Mori Building's original Vertical Garden City concept. It is a hub of culture and information, and boasts state of the art security. The last stop is Tianzifang alley. Tianzifang has transformed itself from legacy residential architectures and factories into an artsy area, housing bars, cafes, crafts shops, design studios, galleries and boutiques. It is ardently supported by crowds of yuppies, trend setters, designers and expatriates, who fall for temptation of old Shikumen houses (stone-framed-door houses) and lanes with infinite novelties. 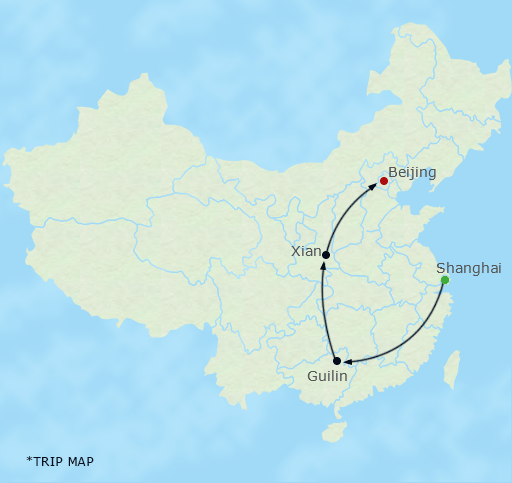 Take flight to Guilin and you will be greeted by your guide at the airport and transferred to your hotel. Tourist spot：Moon Hill and the Tall Banyan Breakfast at your hotel. We intend to leave the day free at Yangshuo. You can find West Street with the breathtaking scenery and have a pot of tea in a sidewalk cafe feeling totally relaxed. You can rent a bicycle to visit the Moon Hill and the Tall Banyan. Overnight at hotel in Yangshuo. Tourist spot：Reed Flute Cave - the Seven Star Park - Elephant Trunk Hill After breakfast at hotel and Drive back to Guilin. Visit the Reed Flute Cave, the Cave is Guilin's largest and most impressive cave, the Seven Star Park, is the largest comprehensive park with mass scenery in Guilin City and the Elephant Trunk Hill, as symbol of Guilin, it has become one of the most popular natural monuments. It resembles an elephant drinking from the Li River. Take flight to Xian and you will be greeted by your guide at the airport and transferred to your hotel. Tourist spot：Mutianyu Great Wall - 798 Art Zone - Peking Duck Banquet. Arrive in Beijing and your tour guide will accompany you in a comfortable vehicle to the hotel and help you with the check-in procedure. Breakfast will be arranged at local restaurant, KFC or MacDonald. The itinerary will take you to Mutianyu Great Wall, you will take cable car to see this vital section of the world famous China Great Wall, Mutianyu has a history of over 1400 years, can trace back to Northern Qi Dynasty (550-570). Standing on the wall and looking at it stretching up and down into boundless distance is an exciting experience. Next you will visit Beijing 798 Art Zone, which is Located in the northeast suburb of Beijing, the previous factory plant has become a haven for artists from home and even abroad. Artists gather here to open galleries, art studios and cafes, and hold all kinds art events, making the area the most resounding name in the artistic circle. In the evening, you will enjoy an authentic and delicious Peking Duck Banquet. Tourist spot：Summer Palace - old Hutongs After breakfast, the first stop of today's itinerary is the Summer Palace. The Summer Palace in northwest suburban Beijing is the largest and most complete imperial garden existing in China. It was first built in the 12th century as an imperial palace. Occupy a total area of 304 hectares, the Summer Palace features hilly and water scenery. The Kunming Lake makes up four-fifths of this royal park. The Long Corridor running east-west along the lake as well as the Pavilion of the Fragrance of Buddha, the Sea of Wisdom, and the Hall of Dispelling the Clouds and Suzhou Street standing south to north on the Longevity Hill are the major scenic spots. The Summer Palace was added to the world cultural heritage list in 1998. In the afternoon, an interesting trip to the old Hutongs will let you feel Old Beijing’s culture. Taking the local rickshaw and traveling along the narrow lanes, you will get a close touch with the original Beijing lifestyle. After breakfast at hotel, Our guide and driver will see you off at the airport today. Hope next time we still have the chance to serve you again.